Monaco, a microstate in Southwestern Europe bordered by France, and the Mediterranean Sea has a total land area of 0.78 square miles and a population of around 30,600. It is the second smallest country and second smallest monarchy and is among the most densely populated countries of the world. With absolutely no natural resources, the mainstay of the economy are its casinos and the country has successfully sought to add more sectors to its economy. To this effect it has added light non-polluting industries by expanding its beaches by reclaiming land and increasing residential options for the wealthy. Though the living standards are high, its tax haven status has earned it negative reputation. Though a year-round destination, the best time to visit Monaco is during April/May and September/October. Though the locals are banned from gambling, tourists descend in droves to try their luck at the casinos, particularly at the Monte Carlo. The other major attractions are the Monaco Grand Prix - the prestigious automobile races, Palais Princier, Monte Carlo's Cathedral, and the various spas that offer treatments at prices that won't break the bank. Since Monaco is generally for the well-heeled with yachts and helicopters at their disposal, many visitors tend to make it a day-trip from France. Its cuisine is Mediterranean with fresh vegetables, olive oil, garlic and fresh fish. Inside Monaco 978-0911445084 $13 Best Guide Book on Monaco. 220 page guide book with pull-out map. 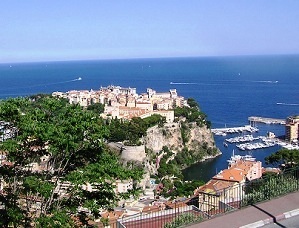 Has good info on Monaco’s nightlife, sights, day trips, discount shopping, and practical tips. Secrets of the Seven Smallest States of Europe: Andorra, Liechtenstein, Luxembourg, Malta, Monaco, San Marino, and Vatican City 978-0781810326 $18 Excellent general introduction to the microstates of Europe. Part 1 is general and economic information on the microstates in about 140 pages followed by around 25 pages each on each micro-state. Nice, Cannes, Monaco Insight Flexi Map 978-9812589903 $9 Laminated. Includes recommended sights. The first stamps of Monaco were a set of ten stamps released in 1885 showing a portrait of Prince Charles III. The set (Scott #1 to #10) catalogs for around $6500 mint and around $2600 used. The lower denominations catalog for less than $100 while the higher denominations catalog into the 1000s. Charles III was the Prince of Monaco from 1856 to 1889. Successful initiation of the gambling Mecca of Monte Carlo happened during his tenure – Francois and Louis Blanc, French Casino magnets bought the royal concession to operate casinos, developed the depressed seaside area of “Les Spelegures” as “Monte Carlo” and built the famous Le Grand Casino de Monte Carlo in 1858. The casino is still operation in the original building. The first set was followed by a long running long-set of stamps portraying Prince Albert I released between 1891 and 1921. That set (Scott #11 to #29) is also rare and expensive cataloging in the $1000 range for mint and around the $400 range for used. This was followed in 1922 with a set of ten stamps showing local scenes. The set (Scott #40 to #49) catalogs for around $60 mint and around $70 used. The designs show Prince Albert I, Oceanographic Museum, “The Rock” of Monaco, and Royal Palace. Albert I was the tenth Prince of Monaco from 1889 to 1922. The Monte Carlo Rally, another global success story for such a small place was first held during his reign in 1911. It is regarded as one of the toughest rallies and was the opening round of the World Rally Championships from 1973 to 2008. A long set of thirty five stamps released between 1939 and 1946 showing local scenes. The set (Scott #160 to #175B) catalogs for around $65 MNH and around $30 used. The designs show Cathedral of Monaco, Saint Nicholas Square, Palace Gate, Palace of Monaco, Panorama of Monaco, and Harbor of Monte Carlo. Tourism along with services based on the gambling industry and its status as a tax haven are the primary sources of revenue. A set of nine stamps released on April 3, 1956 showing global icons/scenes. The set (Scott #354 to #362) catalogs for around $22 MNH and around $12 for used. The designs show Abraham Lincoln, Columbus landing in America, Prince Rainier III, Early Louisiana Scene, and the Palace of Monaco. Rainier III, Prince of Monaco from 1949 to 2005 married American actress Grace Kelly that year. The event focused world’s attention on this small country during the period. A set of five stamps released on May 4, 1981 to mark the 25th wedding anniversary of Prince Rainier and Princess Grace. The set (Scott #1270 to #1274) catalogs for around $12 MNH and around $10 used. Monaco issued almost thousand stamps during the previous 25 years. Prince Rainier III was an ardent philatelist and was involved in the design of Monaco’s issues. The issues are popular among collectors and philatelic market is a source of revenue for Monaco. A set of four stamps released on January 29, 2004 that shows a copy of the statue of Princess Grace by Daphne du Barry. The set (Scott #2319 to #2322) catalogs for around $12 MNH and around half that for used. Grace Kelly died tragically in 1982 when her automobile crashed after she suffered from a stroke. Issues portraying Grace Kelly is a popular theme among the issues of Monaco and forms a good collectible theme. The first coin of Monaco was a Decimal Coinage (10 Centimes = 1 Decime, 10 Decimes = 1 Franc) Cast Brass 5 Centimes Coin issued in 1837. The issue shows Head Portrait of Borrel F. in Obverse and Date and Value in Reverse. It is valued around $125 in UNC. Gold Coins debut in 1878 with the issue of a 20 Francs 0.1867 troy ounce gold coin showing Arms and Date in Reverse and a Head Portrait of the Prince of Monaco in Obverse. Monaco has issued a number of gold coins over the years and they are generally valued at a sizable premium over bullion value. Coins $2 and up Common UNCs start around $2. Bi-Metallic Euro Patterns start around $10. Grace Kelly Bi-metallic Pattern Coins from 2007 start around $15. Official Mint Sets go well into the 100s. Paper Money $100 and up VF Centimes from the 1920s start around $100 and go well into the 100s from UNC. Art, antiques, chocolate, and items for the homefront are the typical souvenirs of the place. Antiques $10 and up Souvenir spoons and other vintage curios start around $10. 19th century maps start around $20. Art $10 and up Vintage travel posters start around $10. Historically relevant 19th and 20th century prints start around $30. Jean Remel, George Ham etc Monaco Grand Prix Art Prints start in the 50s. Grand Prix posters go into the 100s.